In the previous tutorial, we created our very first shader in an effect file. In this tutorial, we will go through the steps of using a shader in an XNA game. This is actually not too hard to do. This code should all look fairly familiar to you, since everything here was discussed in the 3D tutorials. Notice that I'm accessing a specific model. 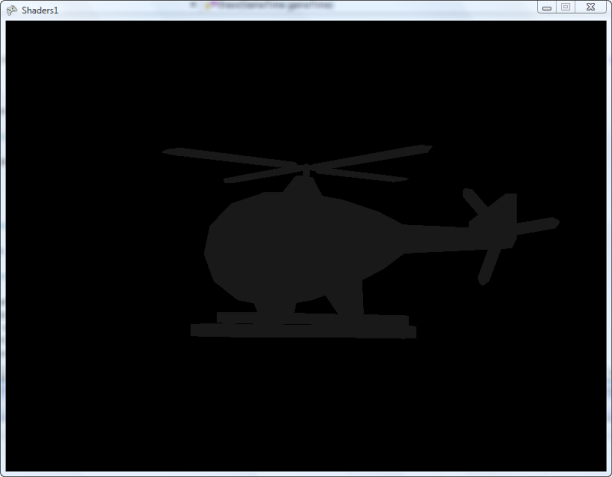 You can change this to access your own model, or you can download the helicopter model from my 3D Model Library. If you placed your effect file in a different directory, or if you called it something other than "Ambient.fx", you will need to put in a different name. It's nice to see, though, that we can load in effects just like models, textures, and everything else. Our code for rendering with an effect is not really all that different, but there are a few differences. Add the following method, to render a model with the effect. You can even replace the old rendering code if you aren't going to use it anymore. Notice, first of all, that the inner loop goes through each of the mesh parts, rather than the effects in the mesh. In the line part.Effect = effect; we set the part's current effect to the one we want to use, which in our case is our instance variable that we loaded in the previous section. The next three lines set parameters for the effect. This is where we set the variables that we defined in the effect file. Inside the square brackets, you put the name of the variable you want to set, and then set the value you want. Since we created a variable called "World" in our effect file, we set it here in our XNA game to be the value that we want. We do the same thing with the "View" and "Projection" variables. Any variable that you have in your effect file can be changed in this same way. The entire code for the completed project is below. You now know how to write a simple shader and use it in an XNA game. From here on, it is just a matter of writing fancier shaders. Our next step is to create a shader that does diffuse lighting, which is the main component of lighting.